From the kitchen of One Perfect Bite...Lady Luck was with me when recipes for the Kraft From Your Kitchen to Your Country Contest were judged. This very simple recipe was our ticket to Hawaii and the gorgeous Na Pali coast on the island of Kauai. The first picture was taken from the Kalalau Trail, forever etched in this grandmother's memory as one mother of a hike. Tough doesn't begin to describe the rock scramble that's called a trail. Effort and exertion aside, it was a wonderful day that ended with dinner in a "place called Hanalei." Puff had vacated the premises years ago, but the teriyake wasn't half bad and the beer was really cold. The contest that took us there is one that was brand oriented. That means it required the use of a lot of the sponsors products. This version of the recipe calls for generic ingredients. It's simple to make and really good. In the "real" world, I use brown rice, homemade vinaigrette and left over chicken to assemble this. It works just as well with products from the grocery store. Here's the recipe. That photo is amazing! And your recipe brought you there? Awesome and delicious too. It is so beautiful! The picture taken is great and also the recipe! Mary, I love to travel with you, and that shot of Hawaii is breathtaking. I've never been. I love that you get to travel with these contests. I'm awed at your cooking ability. It sounds delicious! And any recipe that can take you the islands is a winner in my book. I love Hawai'i!!! If it wasn't so darned expensive to live there, I'd have my little shanty on the beaches, thank you very much! 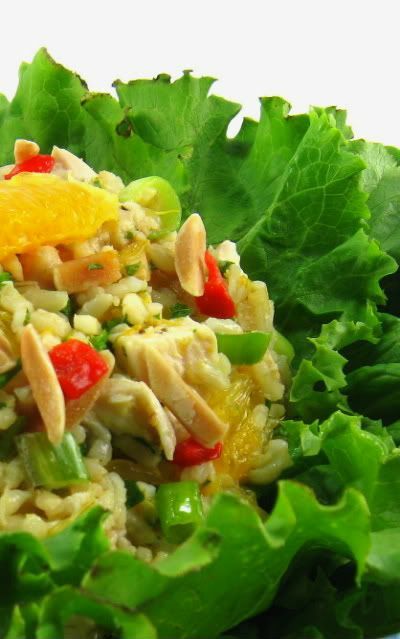 The Chicken and Rice salad sounds delish! My Outdoor Wednesday is flowers with a 'passion'. Come over if you can find time. I'd love your company today. And, hope the day treats you well!!! A beautiful place and a great recipe. Oh that photo has me in awe. Gorgeous! What a fantastic recipe. It sounds wonderful. Wow! that's the only way to go to Hawaii! The recipe sounds awesome. How great that all your culinary works reward you! And, we are rewarded by being able to read your blog. Got another contest in the brewing? Yeap, it's outdoor Wednesday! I've not yet try making salad with rice. It sounds delicious to me. Do I need to chill up the rice before mixing it with other ingredients? WO! I have got to start entering more contests. Not fair. looks great. You have beautiful photo's and that I may have to try this recipe, it looks yummy. I really need to enter more contests - I want a trip to Hawaii! The salad looks delicious and simple to make...love that. 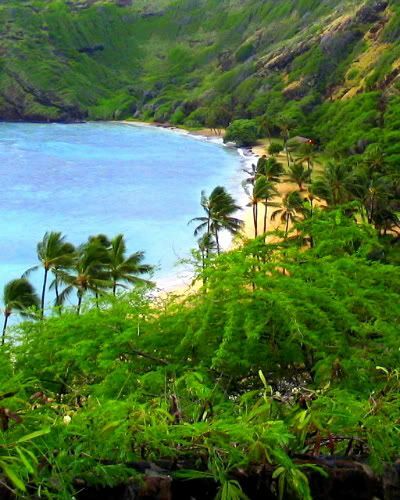 One of the truly beautiful parts of the world, Hawaii. Glad you shared these shots with us. I do not do much cooking anymore, but the recipe sounds really good. That is wonderful you won that trip! and almonds are then added and tossed to combine. At this point you refrigerate. Serve chilled or at room temperature. Hi Mary, this looks wonderful! I love anything with rice in it. Yum!! How wonderful that you came up with such a delicious dish that it landed you in this beautiful spot. Wow..
GORGEOUS and YUMMY!!! Perfect combo! When ever i see a photo of Hawaii I almost want to say... no way you took this. The landscapes there are simply just this gorgeous! Beautiful photo and your Chicken and Rice Salad sounds wonderful. Both photos are beautiful and have a similar look! Isn't that interesting? I was only in Hawaii 40 years ago this week during the touchdown from the moon landing. Got to see the guys returning to Pearl Harbor. Very crowded and very exciting. How amazing Mary! I am so happy you got picked! How in the world do you do all this? I often think you are super woman. Congrats on winning that fabulous trip! The recipe looks delicious and I am going to try it. Love the photos. what a great salad! Yay!! I can't believe you won tickets to Hawaii!!! You know, simplicity is the best, it's the most appealing in recipes. It makes them approacheable and people like that! What a wonderful thing! Your photos are fantastic. Thanks so much for sharing. I am squealing in delight. I love the sounds of your recipe. And that photo. That must be what heaven looks like, I think. There must be some really good eating going on at your house every day! I bet people love to be on your invitation list. And the photo of Hawaii is lovely. Never been there, but it looks beautiful! Gorgeous photograph. And the recipe sounds so good! What a wonderful prize for winning the contest! That's quite an accomplishment, but well deserved. Your Chicken and Rice Salad looks and sounds delicious, and I love the pictures of Hawaii. Hanalei sounds beautiful, but then all of Hawaii is. This is a great recipe to bring to a picnic or a pot luck. And I am just dreaming looking at that picture. Beautiful lagoon and delish dish, what more does one need in paradise? Fantastic picture Mary!I wish I was there! And that salad looks amazing too! Thanks for sharing the recipe! What a beautiful salad - and so wonderful that it transported you to paradise!! Wow! What an awesome prize! I don't think it was luck, more likely talent! You are such an amazing cook! Your husband must be so spoiled! Mary-Congratulation! I think it was more than Lady Luck. The recipe sounds good as does the "crockpot" chicken before it. I loved your pictures! I love chicken and rice and I love Hawaii. Thanks for taking us on a lovely, tasty trip! Wow! a breath taking view! Love the combination of greens. And congratulations for a winning recipe! I am following your blog for more delicious recipes. Thanks for sharing. I want to go to Hawaii. This is so nice that you went with a recipe that looks really good. Isn't the Na Pali coast one of the most beautiful places in the world?! So nice that you won the trip there! The salad looks so fresh and delicious. THAT is beautiful!You got to experience all that because of a SIMPLE dish...HOW WONDERFUL! Got it, Mary. And thank you very much! Between the view and the salad... I would be in heaven! The photo of Hawaii just makes me want to go there more. But I'm not sure I'd be up to the hike you described. Your recipe sounds fabulous & pretty easy (right up my alley). I may have to give it a try. Thanks for visiting my blog & leaving me a comment. Amazing! Hawaii and food! A great combination! Congratulations on your recipe. I love Hawaii you know...and I'm going to make that tomato brunch for my husband.